Western blot analysis of extracts from GDM-1, THP-1, and HL-60 cell lines using Hck (E1I7F) Rabbit mAb. Immunoprecipitation of Hck from THP-1 cell extracts using Rabbit (DA1E) mAb IgG XP® Isotype Control #3900 (lane 2) or Hck (E1I7F) Rabbit mAb (lane 3). Lane 1 is 10% input. 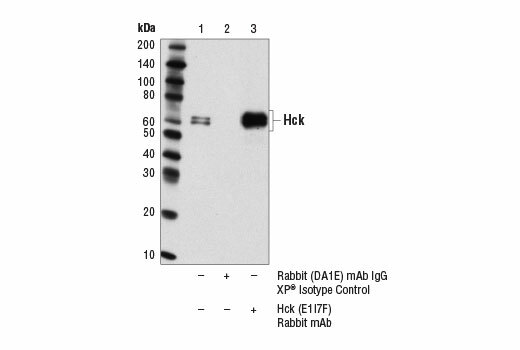 Western blot analysis was performed using Hck (E1I7F) Rabbit mAb. 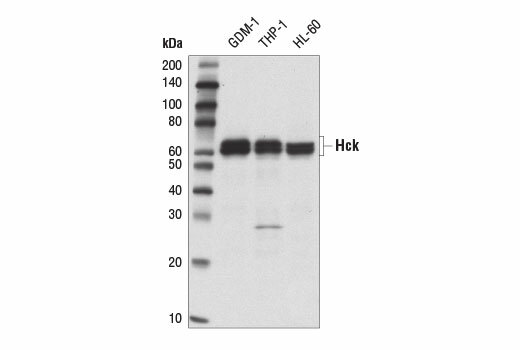 Hck (E1I7F) Rabbit mAb recognizes endogenous levels of total Hck protein. Monoclonal antibody is produced by immunizing animals with a synthetic peptide corresponding to residues surrounding Lys60 of human Hck protein. The hematopoietic cell kinase (Hck) is a Src family protein tyrosine kinase that is prominently expressed in lymphoid and myeloid lineages of hematopoiesis (1). The Hck kinase participates in transduction of a variety of extracellular signals that affect cellular processes, including cell proliferation, differentiation, and migration. Hck protein structure includes a relatively divergent amino-terminal "unique" domain that is subject to post-translational lipid modifications and targets Hck to the plasma membrane. Src homology 3 (SH3) and 2 (SH2) domains, and a tyrosine kinase catalytic domain are adjacent to the "unique" domain. Research studies indicate that phosphorylation of conserved tyrosine residues positively and negatively regulate Hck catalytic activity. Phosphorylation of Hck at the conserved, carboxy-terminal Tyr499 by protein kinase Csk promotes an interaction between the phosphorylated tyrosine and the SH2 domain, rendering Hck inactive. Disruption of this interaction through dephosphorylation, the replacement of the Tyr522 with phenylalanine, or carboxy-terminal truncation mutations, results in constitutive activation of Hck. Autophosphorylation of Tyr411 within the kinase domain positively regulates Hck catalytic activity. Thus, the activation of Hck requires both disruption of the regulatory tyrosine-SH2 domain interaction and autophosphorylation of the regulatory tyrosine residue within the kinase domain (2,3). The dysfunction or dysregulation of Hck may contribute to the pathogenesis of some human forms of leukemia (4). Karasek, M. et al. (1978) Cell Tissue Res 195, 547-56. Ziegler, S.F. et al. (1989) Mol Cell Biol 9, 2724-7. Kefalas, P. et al. (1995) Int J Biochem Cell Biol 27, 551-63. Hu, Y. et al. (2004) Nat Genet 36, 453-61.